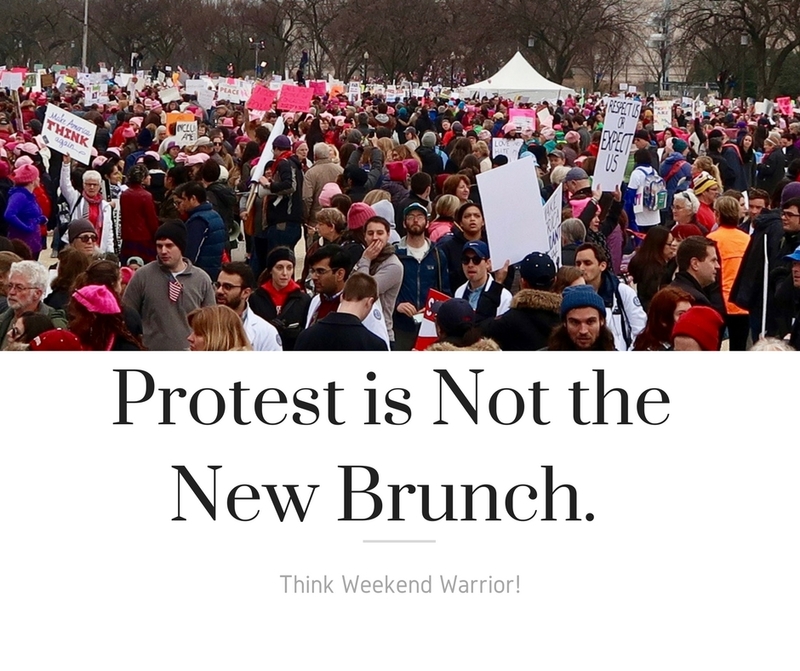 Protest is Not the New Brunch! Protest is not the New Brunch. Brunch is generally a comfortable affair that requires two hours of a lovely Sunday. There is usually warmth, seating and napkins. Typically brunch does not involve shouting in the rain. Brunch does not make you angry—usually. I know I’ve never been arrested at brunch. Brunch doesn’t feel like a second job. Brunch is not something companies join to protect their business interests. And poached eggs certainly don’t have convictions. They’re not even hard boiled! So when a friend said, “Protest is the new brunch,” I nearly vomited in my mouth. The meme is so dismissive, I assume Kellyanne Conway came up with it. Brunch does not accurately describe the all-encompassing response I witnessed the first two weeks of Trump’s presidency. Major corporations, organizations and individuals had to devote resources and time battling big government—and I assume Trump would agree with my assertion that he is the BIGGEST government the US has ever seen. For someone touted as a businessman who knows how to get things done, he did nothing but sow chaos in the very institutions that allow our economy to flow. The weekend Trump signed the Muslim ban, Taxis didn’t run to JFK and attorneys donated pro bono hours to travelers. Thousands were protesting at airports around the country just one week after the Women’s March. Protestors shuttled from JFK to join another protest at the Brooklyn Federal Courthouse where the ACLU argued on behalf of detained travelers. Yemeni bodegas were shuttered the following Thursday in protest. Tech companies spent valuable time collecting signatures on an open letter to oppose an immigration ban. Google created a legal defense fund for foreign employees, and Uber scrambled do the same as 200,000 people began deleting the app. Lyft donated to the ACLU and Uber’s CEO ultimately stepped down from his advisory role with Trump. All this chaos may have amounted to lost income, but not mimosas. Indeed, people are devoting leisure time to protest, but there is far more commitment than the word “brunch” implies. Seeking a better description for the priority shift happening around me, I asked folks how the election was impacting their time both on and off the job. Their responses led to a more accurate metaphor—The Weekend Warrior. Fighting Trumpism is more like a home renovation project than brunch. Think taking down the drywall because fascist bed bugs have infested your democracy. Remember when bed bugs were scary? Because of the sensitive topic, some of those interviewed did not wish to be identified. The names in quotes have been changed. These are the weekend warriors of democracy. More Divided Than Less Productive. Erin Przekop is using every second of downtime to battle Trumpism. 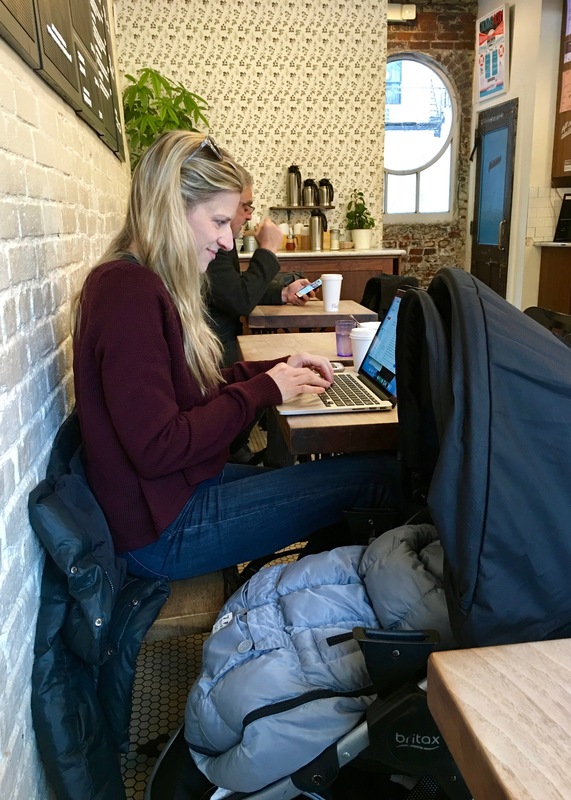 She was busy emailing her members of Congress in a local coffee shop while her 9 month old slept in the stroller. 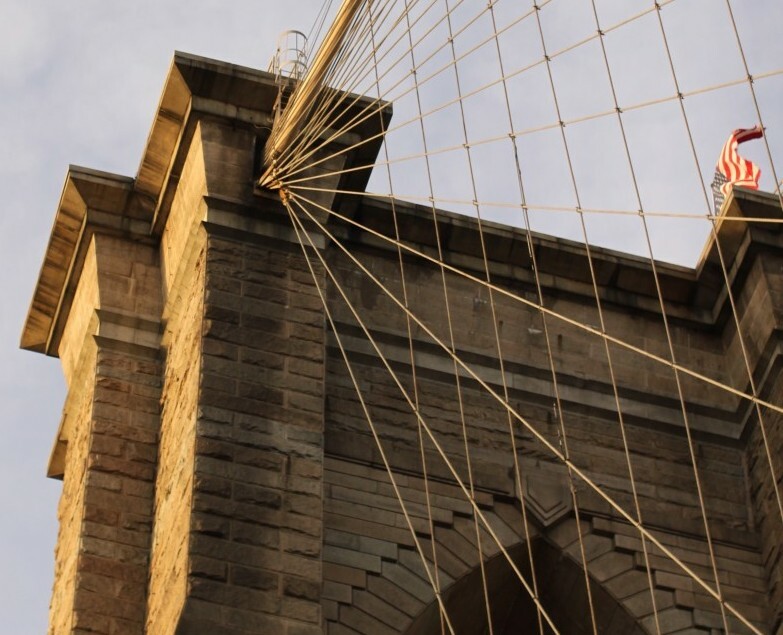 She represents Brooklyn-based artists through her company Fiercely Curious. “I can’t sell art. No one is buying art because everyone is giving to political causes.” On top of that, she was recently at a mother’s group when the issue of political time management arose. “I am having difficulty as full-time mom and business owner, and now on top of that having to be an activist.” She is finding activism to be a full-time job in itself. For Erin Przekop, a sleeping baby equals writing elected officials. Jill Holder has also shifted her personal time priorities to take on the Trump administration. She works in social media marketing for Colgate-Palmolive. She feels more divided in her time, but no less productive. She is confident political distraction on the job is inherently limited by workload and social media policies. Nevertheless, all of Jill’s free moments are spent thinking about this new government. “When you’re not at work it’s absorbing all your time.” She attended both the Women’s March and the protest against the immigrant ban at the Brooklyn Federal Courthouse. Eavvon O’Neal is a freelance video content producer whose productivity has not changed since the inauguration, but notes some of his colleagues have had to give up work due to travel concerns. He has always been in a very politically active circle, participating in Black Lives Matter marches over the course of 2016. Thus, figuring in about 10 to 15 hours per week of downtime to activism was nothing new to him post-election. There is No Focus! We Have to do Something About Everything! While Eavvon has been able to both manage his time and focus his activism, others struggle to target Trumpism efficiently. Erin is running out of time and having trouble focusing on one issue. Her concerns are broad and far reaching: the environment, racism, reproductive rights, and LGBT rights. Erin is not the only mom with this problem. For “April” who works in fragrance, the political situation is all she thinks about everyday. “Bethany,” an employee of Montefiore Medical Center in the Bronx, similarly admits feeling distracted by political events but doesn’t let it interfere with her work. She only reads news during her breaks. She has maintained focus by utilizing her evening hours to co-chair a fundraising committee to bring Syrian refugees to her area. She is herself of Syrian-Jewish descent. That project is now indefinitely on hold due to the refugee ban. Honey, Rallies Will Be A Lot More Fun in the Spring. “April” is a highly committed weekend warrior. What little leisure time she has with two young children has completely changed. Now consumed by activism, her daughter has been to four rallies. Before inauguration, a Saturday might have meant a trip to the museum. Now it’s a cold protest where she’s had to assure her daughter, “Honey, rallies will be a lot more fun in the spring.” This Brooklyn mom even uses her lunch break on Tuesdays to yell in the rain at Chuck Schumer and Kristin Gillibrand’s office. Her favorite chant was, “Have you heard us yet! We’re freezing and we’re soaking wet!” She can’t estimate the number of hours she devotes. “Bill,” a small-business owner in Rhode Island, was in denial until the inauguration. His activism has been confined to Twitter and calling elected representatives, but he is also looking forward to the March for Science in D.C. on Earth Day. In fact, his extended family will be joining them to make a weekend of it to celebrate his son’s 13th birthday. They may or may not have brunch. In Theory, This Could Affect Me. “Bill’s” business in Rhode Island does research and strategy for federal agencies. While there has not been a direct impact to his work by Trump’s federal hiring freeze, he is concerned about what it could mean going forward. However, “Bill” is hopeful any future clients will be able to work within Trump’s executive orders. Whether it’s Uber, Google, Colgate-Palmolive or Montefiore Medical Center, employers have had to shift focus simply to defend their business interests. But while executives have been figuring out how best to manage Trump, I found employees largely confining their activism to the swing shift. Activism rather than leisure has become the priority during evenings, weekends, and even lunch breaks. So, no. Protest is not the new brunch. People don’t commit to brunch for the next four years or until impeachment—unless it’s bellini impeachment. The swing shift activist is the new weekend warrior; at a protest rather than a Home Depot. They are binge reading the news rather than binge watching Netflix. They are trying to understand Congressional procedures and our immigration system. They are reading up on the effects of tear gas and fascism. Their new social calendar might include #ResistTrumpTuesdays or Thursday night pizza at a Sister Districts meeting. Lunch hour is yelling at Schumer’s. The weekend warrior will not be skiing on President’s Day. They’ll be at the Not My President’s Day Rally. Future Saturdays will include the People’s March for Education Justice, the Tax March and the March for Science.